Start off your visit on the 23rd (Sat): contemplate in the serene atmosphere at Catholic Motomachi Church and then get outside with Onuma Park Walking Path. On the 24th (Sun), you'll have a packed day of sightseeing: appreciate the extensive heritage of Motomachi, don't miss a visit to Hachimanzaka, then pause for some serene contemplation at Hakodate Orthodox Church, then contemplate the long history of 函館 観光スポット 旧函館区公会堂 Old Public Hall of Hakodate Ward, and finally look for gifts at Kanemori Red Brick Warehouse. To see more things to do, maps, ratings, and other tourist information, you can read our Hakodate itinerary maker. Vancouver, Canada to Hakodate is an approximately 20.5-hour combination of car and flight. Due to the time zone difference, you'll lose 17 hours traveling from Vancouver to Hakodate. Expect somewhat warmer evenings in Hakodate when traveling from Vancouver in September, with lows around 19°C. Wrap up your sightseeing by early afternoon on the 25th (Mon) to allow enough time to travel to Taketomi-jima Taketomi-cho. Kick off your visit on the 26th (Tue): kick back and relax at Kaiji Beach, then take in the waterfront at Nishi Pier, and then enjoy the sand and surf at Kondoi Beach. Here are some ideas for day two: take some stellar pictures from Nagomi Tower, appreciate the extensive heritage of Island Countryside Settlement, then get engrossed in the history at Taketomi Folk Art Museum, and finally kick back and relax at Kubazaki Beach. To find other places to visit, traveler tips, photos, and more tourist information, read Taketomi-jima Taketomi-cho sightseeing planner. Traveling by combination of taxi, flight, and ferry from Hakodate to Taketomi-jima Taketomi-cho takes 6 hours. Plan for a bit warmer temperatures traveling from Hakodate in September, with highs in Taketomi-jima Taketomi-cho at 36°C and lows at 30°C. Wrap up your sightseeing on the 27th (Wed) early enough to ride a ferry to Ishigaki. Eschew the tourist crowds and head to Tamatorizaki Observatory and Hoshisuna Beach. Your cultural itinerary includes sights like Cape Hirakubozaki and Ishigaki Yaima Village. Change things up with a short trip to Pinaisara Falls in Taketomicho Iriomote-jima (about 2 hours away). There's lots more to do: enjoy the sand and surf at Yonehara Beach, stroll through Kabira Park, stop by Yurateiku Market, and see some colorful creatures with a scuba or snorkeling tour. To find maps, more things to do, and more tourist information, you can read our Ishigaki trip planner. 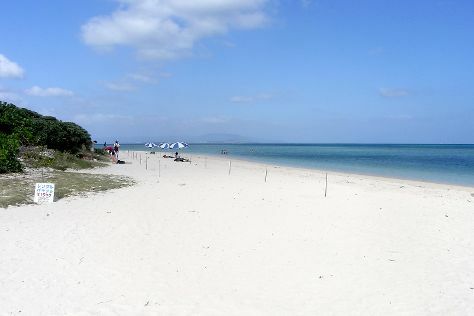 Ishigaki is just a stone's throw from Taketomi-jima Taketomi-cho. Expect a daytime high around 36°C in September, and nighttime lows around 30°C. Finish your sightseeing early on the 1st (Sun) so you can travel to Miyakojima. Explore hidden gems such as Sunayama Beach and Irabu Bridge. Head to Atarasu Ichiba and Furusatofor some retail therapy. The adventure continues: enjoy the sand and surf at Aragusuku Beach, take in the views from Kurima Bridge, stroll through Toguchinohama, and enjoy the sea views from Higashi Hennazaki Lighthouse. To find maps, more things to do, and tourist information, go to the Miyakojima trip generator. Traveling by combination of taxi and flight from Ishigaki to Miyakojima takes an hour. 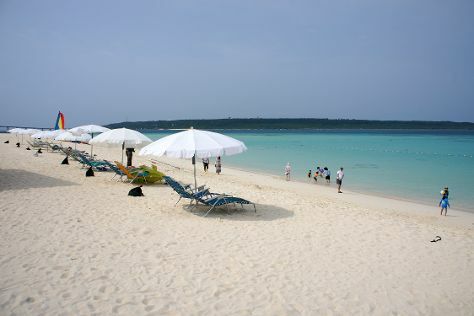 In October in Miyakojima, expect temperatures between 32°C during the day and 27°C at night. Finish your sightseeing early on the 5th (Thu) so you can travel to Naha. Deepen your sense of the past at sights like Sefa-Utaki and The Tower of Himeyuri. Shop till you drop at Nakayukui Market Onna Station and OKINAWA OUTLET MALL ASHIBINAA. 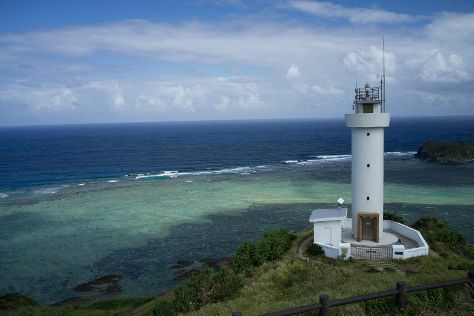 You'll find plenty of places to visit near Naha: Okinawa Peace Memorial Park (in Itoman), Cape Manza (in Onna-son), Furuzamami Beach (in Zamami-son), Aharen Beach (in Tokashiki-son) and Katsuren Castle Ruins (in Uruma). There's still lots to do: step into the grandiose world of Shurijo Castle and expand your understanding of the military at Former Japanese Navy Underground Headquarters. To see more things to do, photos, traveler tips, and other tourist information, go to the Naha trip itinerary planner. Traveling by combination of taxi and flight from Miyakojima to Naha takes 1.5 hours. In October, plan for daily highs up to 32°C, and evening lows to 27°C. Wrap up your sightseeing by early afternoon on the 9th (Mon) to allow enough time to travel to Hiroshima. Hiroshima Peace Memorial Museum and Miyajima are good opportunities to explore the local culture. Museum-lovers will appreciate Hiroshima National Peace Memorial Hall for the Atomic Bomb Victims and Yamato Museum. Get out of town with these interesting Hiroshima side-trips: JMSDF Kure Museum (in Kure) and Mount Misen (in Hatsukaichi). The adventure continues: make a trip to Hiroshima Peace Memorial Park, explore and take pictures at Mazda Zoom-Zoom Stadium Hiroshima, and appreciate the history behind The Cenotaph. To see ratings, photos, where to stay, and other tourist information, you can read our Hiroshima trip planner. You can do a combination of train, subway, flight, and taxi from Naha to Hiroshima in 4 hours. Alternatively, you can do a combination of train and ferry. Plan for a bit cooler temperatures traveling from Naha in October, with highs in Hiroshima at 26°C and lows at 17°C. Finish your sightseeing early on the 12th (Thu) to allow enough time to take a train to Kyoto. Nijo Castle and Kiyomizu-dera will appeal to history buffs. Your cultural itinerary includes sights like Dotonbori and Osaka Castle. Next up on the itinerary: steep yourself in history at Fushimi Inari Taisha, contemplate in the serene atmosphere at Toji, head outdoors with Arashiyama, and don't miss a visit to Gion. To see other places to visit, maps, and tourist information, you can read our Kyoto trip itinerary planner. You can take a train from Hiroshima to Kyoto in 2 hours. Other options are to drive; or do a combination of ferry, taxi, flight, bus, and train. October in Kyoto sees daily highs of 27°C and lows of 17°C at night. Wrap up your sightseeing on the 17th (Tue) early enough to travel to Himeji. The castle around which the city of Himeji has developed represents one of the best preserved in the country, and has been designated as a national treasure and a World Heritage Site. On the 17th (Tue), don't miss a visit to Shoshazan Engyoji, then take in nature's colorful creations at Kokoen Garden, and then explore the historical opulence of Himeji Castle. To see traveler tips, other places to visit, and tourist information, go to the Himeji vacation planner. You can take a train from Kyoto to Himeji in 1.5 hours. Other options are to drive; or take a bus. In October, daytime highs in Himeji are 26°C, while nighttime lows are 20°C. Wrap up your sightseeing on the 18th (Wed) to allow time to drive to Toyooka. 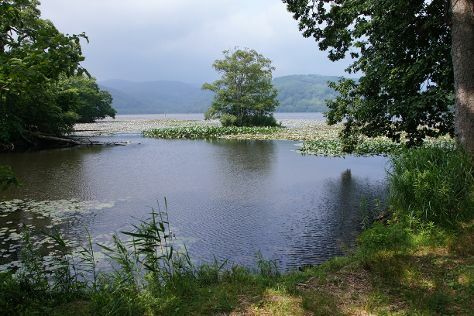 A vacation in Toyooka lets you explore the UNESCO Global Geopark that completely surrounds the small town, notable for its scenic islands, rock formations, caves, and sand dunes. Kick off your visit on the 18th (Wed): don't miss a visit to Izushi Castle Town, enjoy the sand and surf at Hacchohama Kobama Beach, and then kick back and relax at Hamazume Beach. On your second day here, boost your wellbeing at a local thermal spa and then take some stellar pictures from Street of Kinosaki Onsen. 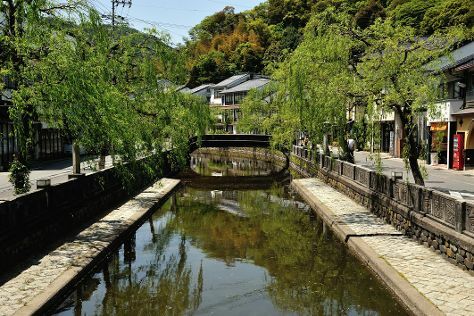 To see other places to visit, reviews, traveler tips, and other tourist information, you can read our Toyooka travel planner. You can drive from Himeji to Toyooka in 1.5 hours. Another option is to take a train. In October, Toyooka is little chillier than Himeji - with highs of 23°C and lows of 17°C. Wrap up your sightseeing by early afternoon on the 19th (Thu) to allow time for the car ride to Kanazawa. Fukui Prefectural Dinosaur Museum and Gassho Zukuri Minka-en will appeal to museum buffs. 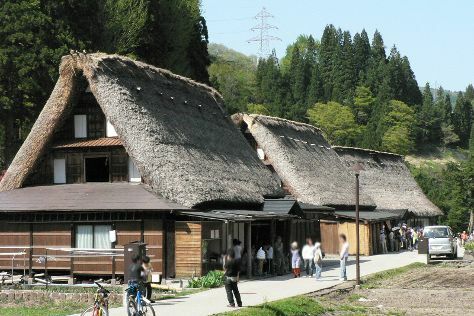 Ainokura Gassho Community and Nomura Samurai House are good opportunities to explore the local culture. Venture out of the city with trips to Chirihama Nagisa Driveway (in Hakui) and Sakai (Maruoka Castle & Tojinbo Cliff). The adventure continues: admire the natural beauty at Kenrokuen Garden, take in the spiritual surroundings of Ninja Temple, browse the different shops at Kanazawa Hyakubangai Shopping Center, and contemplate the long history of Oyama Shrine. To find reviews, photos, and other tourist information, go to the Kanazawa trip itinerary maker. Traveling by car from Toyooka to Kanazawa takes 3.5 hours. Alternatively, you can take a train. Expect a daytime high around 25°C in October, and nighttime lows around 15°C. Wrap up your sightseeing on the 23rd (Mon) early enough to take a train to Tokyo. Tokyo holds the status of most populous metropolitan area in the world--a fact you'll find tangible as you walk the bustling streets and explore its diverse neighborhoods and cultures. Tokyo National Museum and Tokyo Central Railway Station will appeal to history buffs. Do your shopping at Tsukiji Market and Roppongi Hills. Step out of Tokyo to go to Yokohama and see Yokohama Chinatown, which is approximately 46 minutes away. Next up on the itinerary: take a stroll through Ginza, appreciate the extensive heritage of Imperial Palace, shop like a local with Asakusa, and make a trip to Tokyo Tower. To see maps, other places to visit, reviews, and other tourist information, use the Tokyo travel planner. Take a train from Kanazawa to Tokyo in 2.5 hours. Alternatively, you can do a combination of train, taxi, flight, and bus; or drive. Plan for a bit warmer nights when traveling from Kanazawa in October since evenings lows in Tokyo dip to 21°C. Finish your sightseeing early on the 27th (Fri) to allow enough time to travel back home.